It's the 30th anniversary of the agreement. Former Prime Minister Brian Mulroney and federal Environment Minister Catherine McKenna speak to media at a news conference to mark the 30th anniversary of the Montreal Protocol on Nov. 20, 2017 in Montreal. MONTREAL — Environment Minister Catherine McKenna says an amendment to the Montreal Protocol has been signed that will lower the levels of a type of greenhouse gas that warms the planet even more quickly than carbon dioxide. McKenna said in a statement today implementing the Kigali Amendment could avoid up to 0.5 degrees Celsius of warming by the end of the century. The objective of the amendment is to reduce the levels of hydrofluorocarbons, which are used in products such as refrigerators, air conditioners and aerosols. It is scheduled to take effect in January 2019. 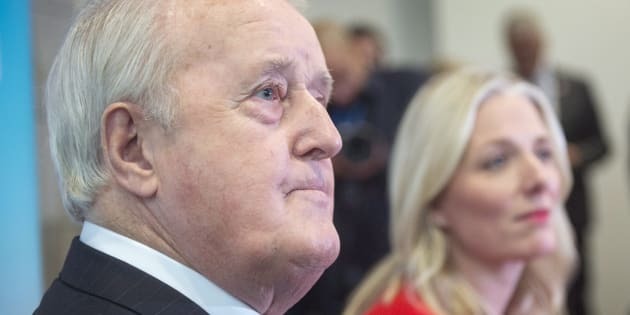 McKenna and former prime minister Brian Mulroney were in Montreal today to mark the 30th anniversary of the Montreal Protocol, which was aimed at protecting the Earth's ozone layer. Mulroney was prime minister at the time. McKenna called the Kigali Amendment a "big step forward in tackling climate change." "Kigali will deliver new momentum to the world's efforts to avoid dangerous global warming and accelerate clean growth," she said in the statement. "I'm very proud that Canada is among the leaders in ratifying this amendment, and I congratulate the other 20 countries whose hard work made this happen."